Roads in New York City and elsewhere in the southern part of the state were closed to traffic as of 2:30 p.m.
A fearsome blizzard that dumped more than 26 inches of snow on Central Park and much of the tri-state region Saturday brought trains, planes and automobiles to a standstill and threatened to become a record-breaking winter storm. Approximately 26.8 inches of snow had fallen in Central Park by 12:15 a.m. Sunday — the second largest snowfall since records were kept in 1869. The amount is .1 inches away from breaking the all-time record of 26.9 inches set in Feb. 2006. The unrelenting snowfall claimed the lives of five men, who died from the exertion of shoveling snow, according to police. All streets in New York City and Long Island were closed to traffic from 2:30 p.m. Saturday to 7 a.m. Sunday under an order issued by Gov. Cuomo. Rail lines were also affected. Metro-North and Long Island Rail Road came to a halt just after 4 p.m., and New Jersey Transit was closed. Above-ground subway lines in New York City also stopped running at 4 p.m. The Port Authority of New York and New Jersey closed the George Washington Bridge, Lincoln Tunnel, Holland Tunnel, Bayonne Bridge, Goethals Bridge and Outerbridge Crossing. The bridges and tunnels will reopen at 7 a.m. Sunday. City buses are expected to be back on the streets when the traffic ban is lifted, officials said. To enforce the traffic ban, the NYPD set up checkpoints at various locations in the city. "If you are on the road and you don't need to be there, you are subject to arrest," said NYPD Chief of Department James P. O'Neill. "It's not what we want to do, but if we have to do it, we will." Prior to the ban, city police responded to 312 accidents, O'Neill said. Officers assisted 343 motorists, he said. The NYPD also warned pedestrians to walk on sidewalks, not in the streets, despite the traffic ban. Two men, ages 78 and 80, in Queens and a 67-year-old man on Staten Island died while shoveling snow, police said. Two died on Long Island: a 61-year-old West Hempstead man and a 94-year-old Smithtown man. Mayor de Blasio appealed to residents to remain in their homes, if possible, and noted that the storm would likely rank among the top five snowfalls in city history. "This is a storm that's packing a lot of punch," he said during a late afternoon news conference. LaGuardia Airport had more than 24.5 inches by Saturday night. and Newark airport had more than 21 inches. The storm had dumped 27.7 inches of snow on JFK International Airport by Saturday night. The area's three major airports canceled 2,021 flights, according to Flight Aware. Gov. Cuomo had declared a state of emergency. About 600 members of the National Guard were on standby. All Broadway shows, both matinees and evening performances, were canceled Saturday, The Broadway League announced. The New York Islanders postponed its game at Barclays Center and Bruce Springsteen postponed a performance scheduled for Sunday at Madison Square Garden. Areas in Westchester and northern New Jersey were pounded with 15 to 22 inches of snow, Storm Team 4 said. Elizabeth, New Jersey, had nearly 28 inches by Saturday night. Heavy snow caused the roof of a Trader Joe's grocery store in Westfield, New Jersey, to collapse. No injuries were reported. The storm had covered Westfield with 22 inches by Saturday night. By Saturday night, parts of Long Island were buried in snow. Hicksville had 27 inches of snow, Commack had 26.6 inches and Islip had more than 23 inches. Roads were treacherous as damaging winds combined with heavy snowfall to create limited visibility in New Jersey. Hoboken and Newark declared a state of emergency and banned driving except for public safety and essential services. New Jersey State Police had responded to 222 traffic accidents as of 1 p.m., the agency said. Troopers also had aided 868 motorists. Residents of the Jersey Shore and parts of Long Island worried that a dangerous cocktail of snow, astronomical high tides and a wind-swept storm surge could cause significant coastal flooding and beach erosion. Utility workers restored power to more than 22,000 customers whose service was knocked out by the snowstorm in New York City and Long Island. Nearly 870 customers on Long Island were still reporting outages Saturday evening, a PSEG official said. 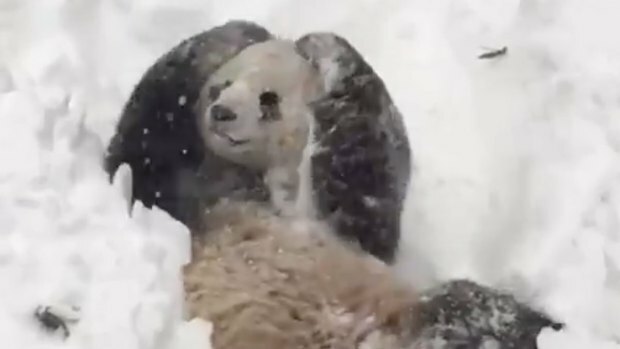 Tian Tian the panda plays in the snow on Jan. 23, 2016 at the National Zoo in Washington, DC. Officials say don't use it. Mayor de Blasio tells NBC 4 New York that residents should stay indoors and off public transit if at all possible. Subway lines above ground were shuttered at 4 p.m.; other service was limited. See the latest service updates here. All scheduled weekend work on the subway is canceled, including the planned 7 train shutdown. Stations that would have been closed for planned weekend work will be open, unless the storm weakens significantly or moves away. This does not include the longer-range outages like the N train stations in Brooklyn, which remain closed. MTA bus service was suspended at noon Saturday. Long Island Railroad trains were bypassing some stations, and service was suspended on the Port Washington Branch. Delays have been reported systemwide. See the latest LIRR alerts here. Metro-North Railroad service was being suspended at 4 p.m. See the latest Metro-North advisories here. NJ Transit bus and rail service won't resume until conditions allow, Gov. Christie says. The rail also says the storm could cause changes, delays and redirections on buses, commuter lines and the Hudson-Bergen light rail.The transit service is cross-honoring tickets and passes system wide all weekend. See the latest NJ Transit alerts here. PATH train service was suspended between Newark and Grove Street stations. Service remains available between Grove Street and Hoboken, the World Trade Center and the uptown 33rd Street line in Manhattan. See the latest PATH advisories here. NY Waterway canceled ferries after 7:10 p.m. See the latest NY Waterway advisories here. The Staten Island Ferry is running normally. No service changes to ferry service have been announced. The Seastreak Ferry suspended service Saturday. See the latest Seastreak Ferry advisories here. Amtrak has announced several changes to rail service. Acela Express, Northeast Regional and several other lines that run to and from New York City were operating on modified schedules. See the latest Amtrak alerts here. New York City cabs were planning to operate as long as there is no travel ban, according to the Taxi and Limousine Commission. But as officials have urged, people should not be on the roads if they can avoid it. Westchester's Bee-Line Bus System service is suspended. Check all school closings and delays here. All New York City public school events are canceled Saturday and Sunday. Other after-school and weekend programs at districts around the region have been canceled. Check with your district for the latest announcements. SATs have been postponed at some test centers in New York, New Jersey and Connecticut. All flights have been canceled or suspended at Newark-Liberty International Airport, LaGuardia Airport, and John F. Kennedy International Airport. Several airlines have waived flight change fees. United, Delta, American Airlines, JetBlue and others allowed passengers to switch their flight for free ahead of the storm. Hundreds of cancellations and delayshave racked up at the region's three airports. Roads are treacherous. Gov. Andrew Cuomo tells NBC 4 New York that it's imperative that people stay off the roads. "If you go out in your car today chances are you're going to get into trouble," he said. On the FDR drive, drivers experienced visibility so low that they couldn't see the East River. Vehicular travel was banned as of 2:30 p.m. Saturday in New York City, on Long Island and at crossings including the George Washington Bridge, Lincoln Tunnel, Holland Tunnel, Bayonne Bridge, Goethals Bridge and Outerbridge Crossing. Plows are out. Kathryn Garcia, New York City's sanitation commissioner, tells NBC 4 New York that plows have been out since 5 a.m. Saturday, and there were 15,000 tons of salt on hand, but with up to 3 inches of snow falling per hour it will be difficult to clear streets. Check here to see when a location was plowed. In New York City, alternate side parking is suspended Saturday, Jan. 23. Mayor de Blasio said he expects additional suspensions early next week as well. In Hoboken, a travel ban is in effect. A list of emergency snow routes is available at hobokennj.org/snow. The city is providing reduced rates at municipal garages for residents. In Newark, all cars are required to stay off city streets until 6 a.m. Sunday. Barnegat, New Jersey, has issued mandatory evacuations for homes near Bayshore Drive. Voluntary evacuations have been suggested elsewhere as well. Brick, Manasquan, Toms River, Union Beach and Tuckerton Beach, New Jersey, have issued voluntary evacuations. The NYPD reported 300 vehicles towed and 200 accidents as of 2:30 p.m.
New Jersey State Police reported 222 crashes and 868 vehicles requiring assistance as of 1 p.m. The NHL has postponed Saturday night's game between the Philadelphia Flyers and New York Islanders at Barclays Center. Power outages impacting more than 50,000 customers were reported in southern New Jersey, especially Ocean County. Hempstead Village on Long Island experienced a sizeable outage, but most customers were soon restored. Trash and recycling pickup has been canceled in New York City on Saturday. New York City's Winter Jam, planned for Saturday in Central Park, has been canceled. Broadway shows were canceled Saturday. Check for updates here and on each individual show's website. Public Libraries in New York City are closed Saturday, as is the Smithsonian's National Museum of the American Indian in Manhattan, the Brooklyn Museum and other institutions. The 9/11 Memorial and the observatory atop One World Trade Center are closed.